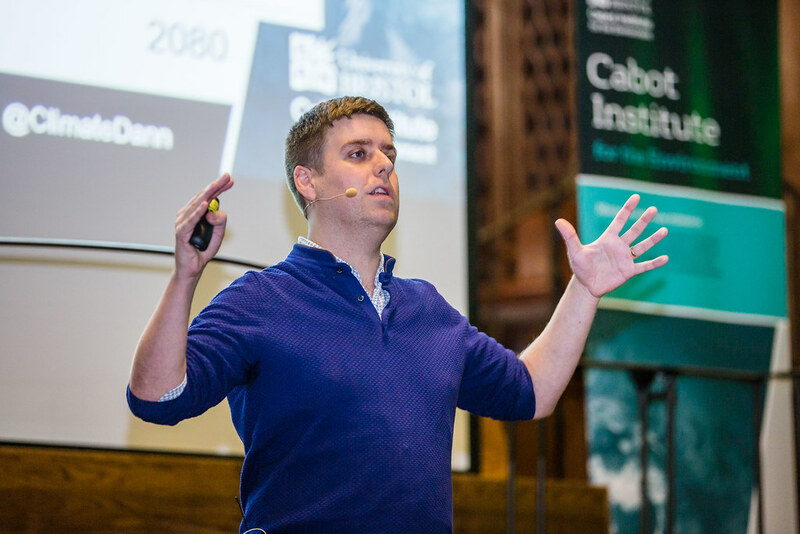 This year the Cabot Institute Annual Lecture posed a critical question: where are we with current efforts to tackle global climate change? 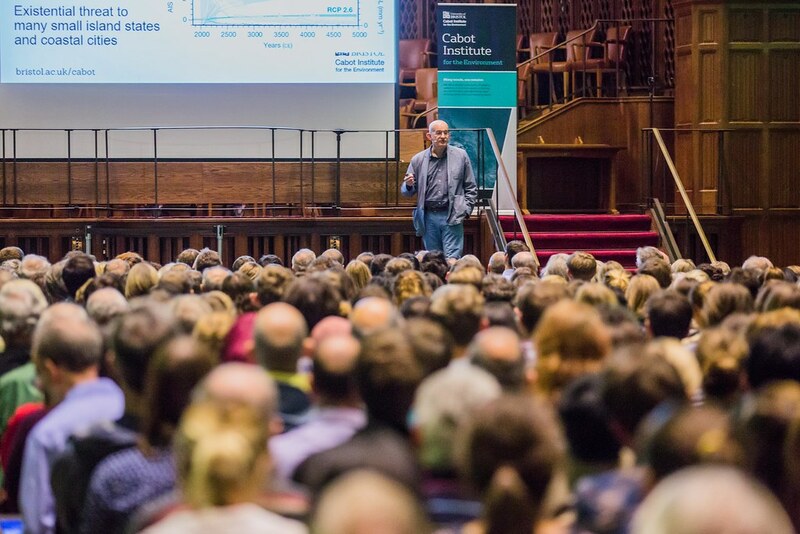 The event brought together over 800 people to hear from leading Cabot Institute experts in climate science, policy, and justice, Dr Jo House, Dr Dann Mitchell, Dr Alix Dietzel and Professor Tony Payne. It was both an appraisal of the findings of the recently published report of the Intergovernmental Panel on Climate Change (IPCC), and a grounded call to climate action. In 2015 world leaders adopted the Paris Agreement committing all parties to limiting global average temperatures to well below 2 °C above pre-industrial levels and to pursue efforts to limit warming to 1.5 °C. All countries undertook to achieve global peaking of greenhouse gas emissions as soon as possible and to enact increasingly ambitious mitigation measures in line with the overarching temperature goals. The Paris Agreement, in contrast to the preceding Kyoto Protocol, is not based on legally binding reductions targets for developed countries, but on a voluntary system of pledges known as ‘nationally determined contributions’ for all parties which will be subject to a stocktake of global progress every five years, beginning in 2023. Although the Paris Agreement initially offered great promise with pledges being made by both developed and developing countries, a report by the UN Environment Programme in November 2017 examining progress towards the global temperature goals found that even if all current pledges are honoured, we remain on track for some 3 °C of warming by 2100. In light of this, and under the Presidency of Fiji, the first Small Island State to preside over a Conference of the Parties at COP23 last year, the focus has been on building momentum for more urgent action through the facilitative ‘Talanoa dialogue’ and on hashing out the final operating procedures for the Agreement. The findings of the IPCC Report on Global Warming of 1.5°C, published on 8 October represent a further important piece of the picture of global progress, which three of the Cabot speakers shed light upon as contributing authors. The findings of the report are significant in illustrating the projected differences in climate change impacts between the 1.5°C and 2°C temperature thresholds. Dr Dann Mitchell outlined the evidence for increases in regional mean temperatures and for the increasing likelihood of temperature extremes of the kind witnessed during this summer’s European heatwave, which we could see occur almost every year at 2°C of warming. These extremes, together with the projected intensification of storms presented in the report, are closely linked to human risks to health, wellbeing and livelihoods. Professor Tony Payne echoed these concerns with respect to the findings of the report on sea-level rise which predict an extra 10cm rise between the 1.5°C and 2°C temperature thresholds, equating, in turn, to an additional 10 million people at risk of related impacts including inundation and displacement. The destabilisation of the ice sheets is set to become more likely beyond 1.5°C, entailing risks of much greater sea-level rise in the future. Professor Payne further outlined the strikingly severe consequences for coral reefs of the two temperature thresholds, with projections that at 2°C all coral in the oceans will die, while by limiting temperature to 1.5°C, some 10-30% of coral will survive. Reefs are not only crucial for the maintenance of healthy marine ecosystems, but also for the millions of people around the world who depend upon those ecosystems for their food security and livelihoods. 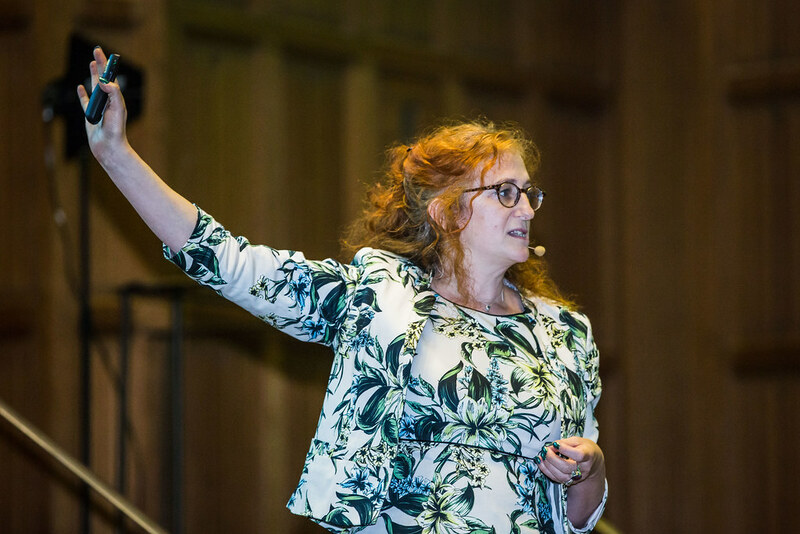 Against these stark warnings on the significance of limiting global temperatures to 1.5°C, Dr Jo House outlined some key recommendations for how we can get on track. The IPCC report sets out a number of pathways for action, each calling for changes across a broad spectrum of policy sectors with the aim of rapidly reducing greenhouse gas emissions and enhancing the absorption of existing carbon in the atmosphere. These changes include moving away from fossil fuels to renewable sources of energy, greening the transport sector, replanting forests, and investing in carbon capture and storage technologies. Dr House underlined the importance of action at all levels of governance to meet these goals. 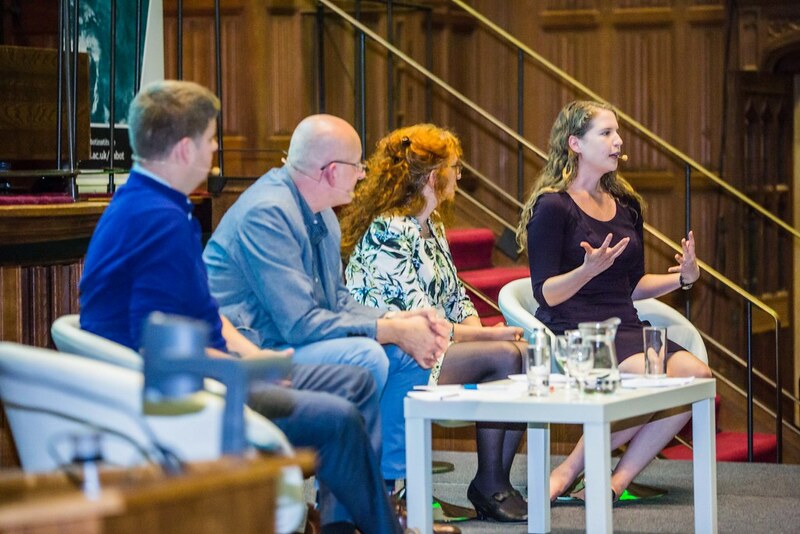 At the national level in the UK under the provisions of the Climate Change Act we are already committed to an 80% reduction on 1990 levels by 2050, while at the city level in Bristol, the Climate and Energy Security Framework commits to the same target, with a 50% reduction to be achieved by 2025. This action in climate policy is increasingly being driven by sub-state actors and Dr Alix Dietzel highlighted the crucial role that local government, civil society groups, citizens initiatives, corporations, and individuals are playing in this. Dr Dietzel expressed cause for hope in the reaction of sub-state actors to the announcement of the withdrawal of the United States from the Paris Agreement, with the ‘WE ARE STILL IN’ movement garnering support from city mayors, governors, tribal leaders, universities, and businesses for continuing commitment to the Paris goals. At the individual level, the actions we can all take within the boundaries of our own capabilities were discussed, outlining our capacity to affect change through our consumption and lifestyle choices. The need to consider the ethical questions surrounding our responsibilities as individuals and global citizens remains crucial, particularly in light of the disproportionately harmful effects that climate impacts will have upon those who have contributed least to the problem. The risks of inaction on the 1.5°C threshold were balanced against the opportunities and benefits of action by the panel. The successful lobbying efforts of climate-vulnerable states to embed the 1.5°C threshold within the Paris framework, alongside the commitment of many governments and sub-state actors to meet it, are cause for hope but we still have a long way to go. 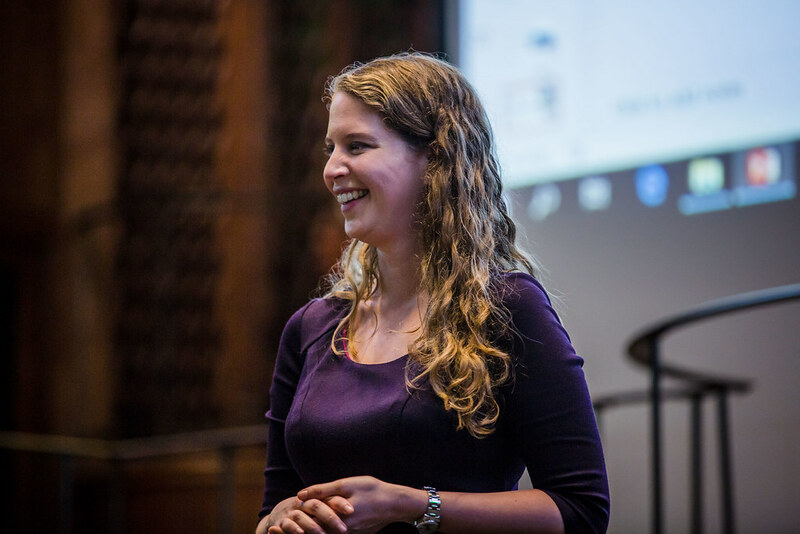 This blog was written by Cabot Institute member Alice Venn, a PhD Candidate in Environment, Energy & Resilience at the University of Bristol's Law School. View our Moments or check out #CabotLecture2018 on Twitter.